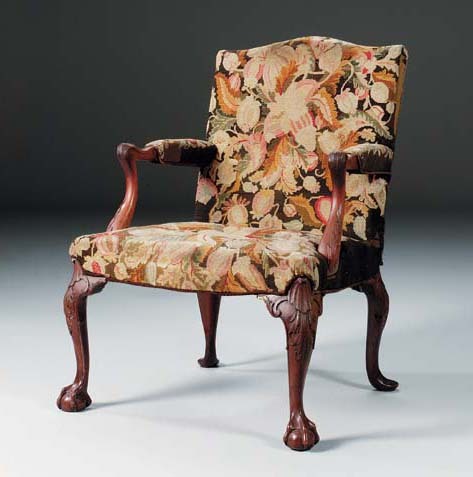 This type of mahogany library armchair is conceived in the 'French' serpentined fashion of the 1750s and early 1760s. It is unusual, however, to find the combination of 'English' claw-and-ball foot with the 'French' elbow. The more usual design of such 'French' chairs combines scrolled feet and scrolled arm terminals. This particularly French arrangement (of the arms) relates to a chair formerly at Hornby Castle, Yorkshire and illustrated in R. Edwards, The Shorter Dictionary of English Furniture, London, 1977, p. 152, fig. 137. The design of the legs is distinguished from many of this type by the upspringing shell, issuing from the acanthus leaf at the head of the legs. A similar form of leg is found on a chair with parcel-gilt enrichments, but with scrolled feet, from Holkham Hall, Norfolk (ibid., op. cit, p. 144, fig. 108). A further related pair, although possibly slightly earlier in date, was sold from the Moller Collection, Sotheby's London, 18 November 1993, lot 52 (a pair) (£144,500 inc. premium).